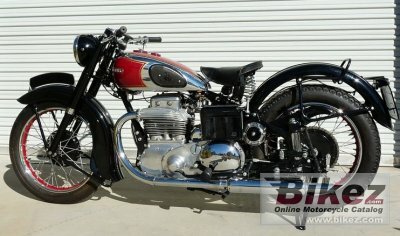 1958 Ariel 4G Square Four Mark II. Picture credits - Sohclassicas.blogspot.no. Submit more pictures. Engine details: Double twin cylinder arranged as a square. Lubrication system: Dry sump with dual oil pump. Light: 7.5 inch, 30 Watt headlamp. Comments: Also called �Squariel�. Designed by Edward Turner. Mark II has separate barrels, a re-designed cylinder head with four separate exhaust pipes from two cast-aluminium manifolds and a rocker-box combined with the inlet manifold. Sidecar option. Ask questions Join the 58 Ariel 4G Square Four Mark II discussion group or the general Ariel discussion group.